Transfer Floor Trailers: Your Efficient Hauling Solution - Kingpin Trailers LTD.
At Kingpin Trailers, we are proud to offer customers across Western Canada leading solutions for your hauling and transport needs. With offices located in Edmonton, Calgary, Vancouver, and Winnipeg, Kingpin makes it easy to expand your fleet, as well as service existing trailers to keep your operations running smoothly. For those in the forestry, municipal waste management, construction and demolition industries, transfer (moving) floor trailers provide a wide range of benefits and are a preferred method of safe transport of challenging materials. Learn more about the applications and benefits of moving floor trailers, as well as Kingpin’s current inventory below. When you need to load, transport, and offload debris, waste, mulch, wood chips, compost and more, transfer floor trailers offer several benefits for haulers. Capable of handling heavy-volume capacity needs (up to 59,000lbs), moving floor trailers make it simple to transport your load from the pickup site to the next destination safely. 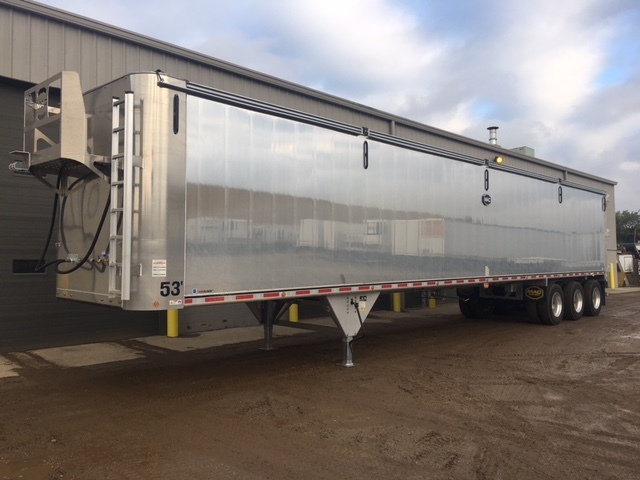 Built from durable materials that are designed to withstand the challenges of unique loads (compost, municipal waste, and more), these trailers often come in a variety of floor and container thicknesses to reduce wear and tear over time. Next to the ability to haul heavy loads, the predominant benefit of transfer trailers comes down to their ability to quickly and safely offload contents. A built-in moving floor allows for greater operational flexibility and expedites the unloading process by manually expelling contents via the slats at the bottom of the container. This is particularly useful for loads that may be difficult to dump via a tip trailer, or loads with debris that may breakdown into smaller, harder to remove pieces, during transport (organic materials, for example). The 2019 53’ MAC Moving Floor Trailer is a triaxle design on a sturdy aluminium frame. Capable of handling loads up to 59,000 lbs and featuring a catwalk style moving floor as well as aero rolling tarp system, this trailer is sure to make hauling a breeze. Contact our team directly to learn more about this model, as well as to inquire about any general stock or repair information.